So Fashionably Frugal: Coral Clothes/ Accessories I'm Currently Crushing On! 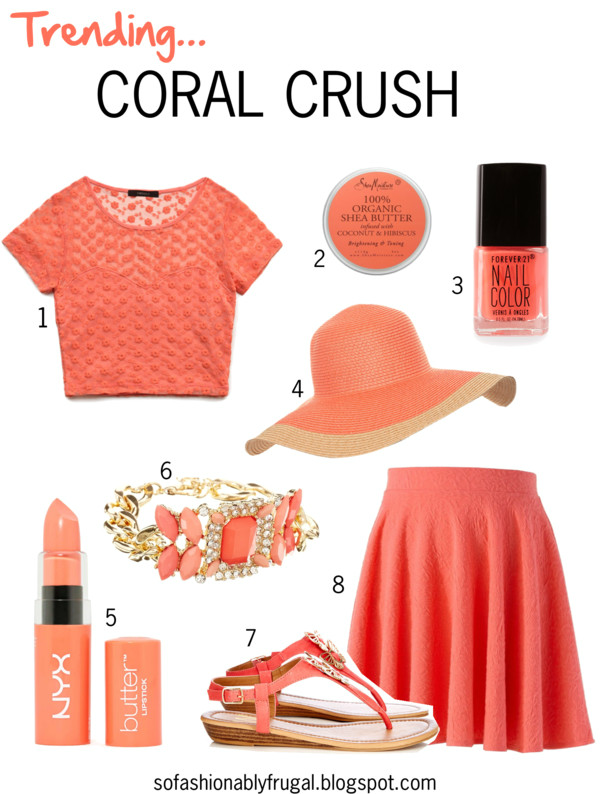 Coral Clothes/ Accessories I'm Currently Crushing On! Something about the end of Spring and beginning of summer makes me want mint and coral colored everything. Anyone else like this? I'd love to know why it's so addicting!! Just my nail polish box is proof enough. I have so much I could honestly paint an entire wall. And that's embarassing! 1) Stitched Floral Crop Top, Forever 21, $10.80 : First of all, the price of this top is pretty crazy. Why I looove Forever 21. The lace detail is very romantic, and what I love about this is that there's a backing inserted from the chest down, so only the shoulders are sheer lace. 2) Shea Butter w/ Coconut & Hibiscus, Target , $9.09 : Target has some pretty awesome beauty products, and this is one of them. It's Organic, so you don't have to worry about yucky chemicals. Not to mention that it also smells amazing and makes your skin really soft! 3) Coral Creation Nail Polish, Forever 21 ,$2.80 : The nail polish at Forever 21 has really gone up a notch, and I am loving it! You can get really similar colors to more expensive brands out there, and lately some of their glittery nail polishes really reminds me Deborah Lippman's. This color is the perfect shade of coral in my opinion. 4) Color Block Floppy Hat, Dorothy Perkins , $21 : I'm not a big fan of floppy hats, but I definitely want to be...so I've been checking them out before I try one out for the first time. I think this one is perfect for a day at the beach or lounging by the pool. The woven fabric of the hat also allows some air to flow through it...so your head won't be as hot as it would with say...a baseball cap. 5) NYX Butter Lipstick in Lollies, Nasty Gal , $6 : NYX products have never let me down. For me they've always been very saturated in color and don't feel cheap in the least. I haven't tried this exact lipstick yet...but the color was too cute to resist putting on here! Plus, it has high reviews on Ulta. 6) Sunburst Coral Chain Bracelet, Asos , $28.22 : I'm a big fan of chunky statement pieces, and this is definitely one of them! The mix of gold, shades of coral, and sparkle makes it a conversation starter. Plus, I think it would be really cute stacked with a bunch of delicate bracelets. Anyone else into the arm candy look? 7) Coral Butterfly Sandals, Wallis , $35 : I love how these have a slight wedge to them. I don't know about you guys, but arch support is pretty important to me. Nothing like ending a day with super sore feet. Even if my sandals have a little wedge like this, I'm a lot happier than I am with plain flip flops. Man I sound old writing about arch support...lol. The best part is the gold butterflies on the front! They make them really unique and delicate looking. 8) LC Lauren Conrad 'Textured Circle Skirt', Kohls , $32.99 : The circle skirt is pretty ingenious because it flatters any body type and gives the illusion of a smaller waist. At least, that's what I've read multiple times in magazines. That in itself is the reason I love circle skirts, but this one by Lauren Conrad has a great texture to it that makes it look like it's made of a more expensive material. The color is also beautiful. Wishing you all a wonderful week! As always, thank you so so very much to all of my amazing followers. You're the best, and I love to hear your comments and suggestions. So feel free to leave me a message here or on Twitter!